The Darkness, multi award winning, multi-million selling megaband formed in 2000 by the Brothers Hawkins, Frankie Poullain and (now departed) Ed Graham have had good years and bad. And some years where they didn't actually do anything. 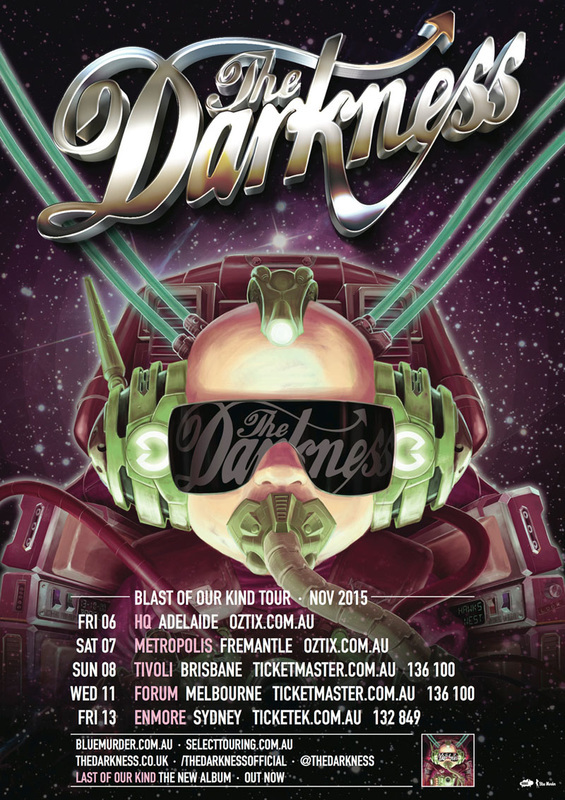 This year is a good'un, because The Darkness are back with their fourth album Last of Our Kind, released in June 2015, a new drummer, Rufus Taylor (son of Queen drummer Roger Taylor) and now they are back for an Australian Tour! The Darkness came to prominence with the release of their debut album, Permission to Land, in 2003. Backed by the singles I Believe in a Thing Called Love, Growing on Me, Get Your Hands off My Woman and Love is Only a Feeling, the album was certified quadruple platinum in the United Kingdom. In 2004 the band won three Brit Awards; Best British Group, Best British Rock Act, and Best British Album. Tickets on sale 9am Thursday 6th August.